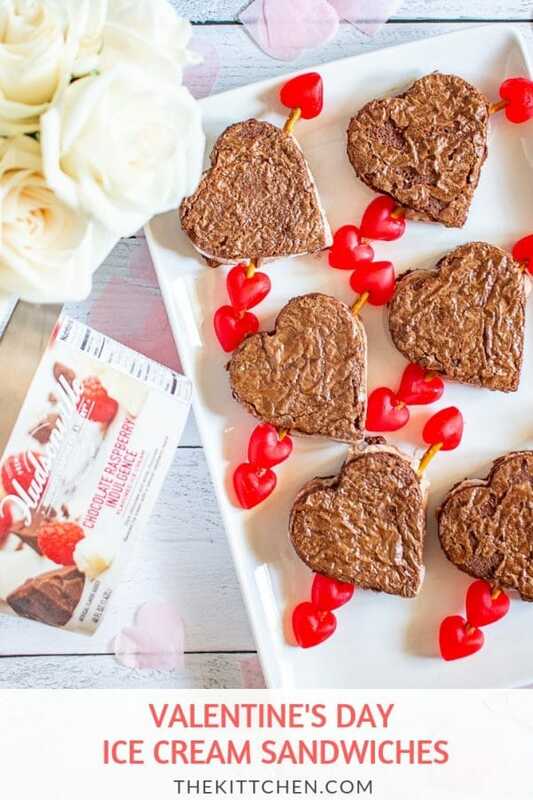 Today I am partnering with my go-to ice cream brand, Hudsonville Ice Cream, to share instructions for how to make festive Valentine’s Day Ice Cream Sandwiches! Valentine’s Day is just a week away! Don’t panic. 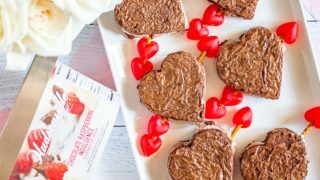 I am sharing an easy and adorable dessert that will make your Valentine’s Day celebration a little bit sweeter. You can make these ice cream sandwiches with any ice cream flavor, but I used Hudsonville’s Limited Edition Chocolate Raspberry Indulgence. This flavor combines dark chocolate and white chocolate ice creams with a natural raspberry ripple. I love the contrast of the rich creamy ice cream and the fresh raspberry flavor. I found Hudsonville Ice Cream’s Chocolate Raspberry Indulgence at Tony’s Finer Foods in Chicago. You can use Hudsonville Ice Cream’s Scoop Locator to find a store near you that carries the brand. 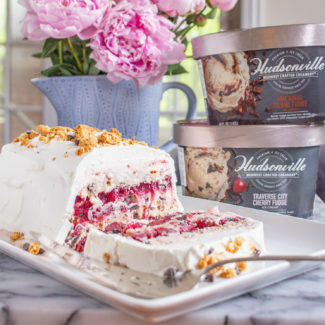 Right now, you can get a coupon for $3 off two cartons of Hudsonville Ice Cream’s current Limited Edition flavors (Chocolate Raspberry Indulgence and Hazelnut Cinnamon Bun) by following this link. I love working with Hudsonville Ice Cream not only because I love their products, but because it’s a delicious ice cream made by a brand that prides itself on treating their employees like family. Another part of the brand’s ethics is rooted in tradition. The brand has been using the same base recipe for most flavors since 1926, and it’s one of the creamiest ice creams that I have tasted. They also have a huge variety of flavors! 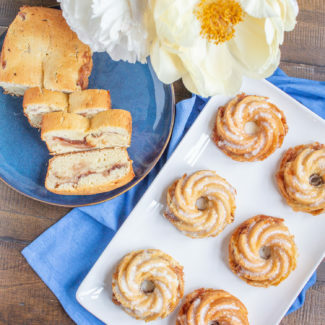 They have over 50 flavors ranging from my favorite vanilla, the Creamery Blend Vanilla, to unique offerings like Strawberry Cheesecake and Brownie Batter Cookie Dough. 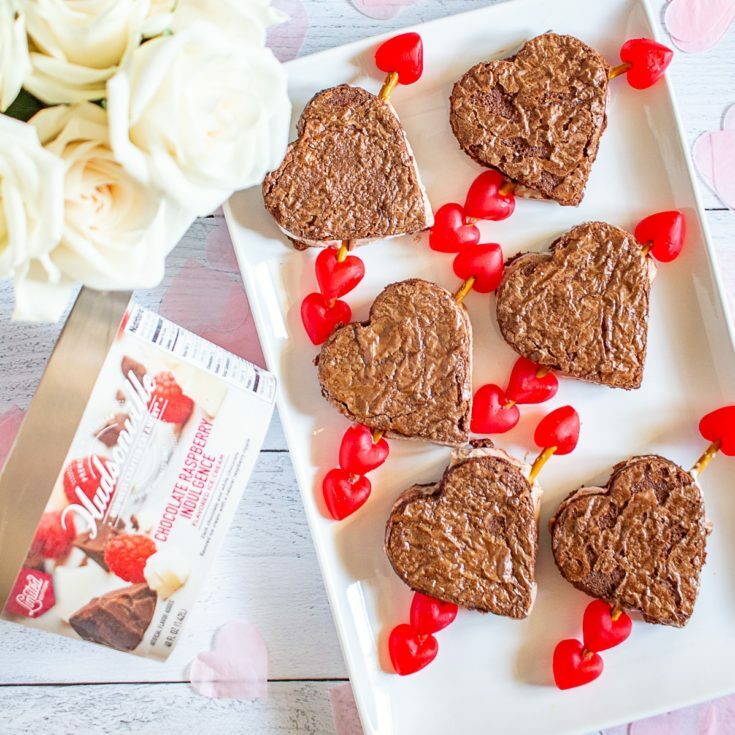 To make a special Valentine’s Day treat, I used the Limited Edition Chocolate Raspberry Indulgence Ice Cream to make ice cream sandwiches! The process of making these ice cream sandwiches is easy. 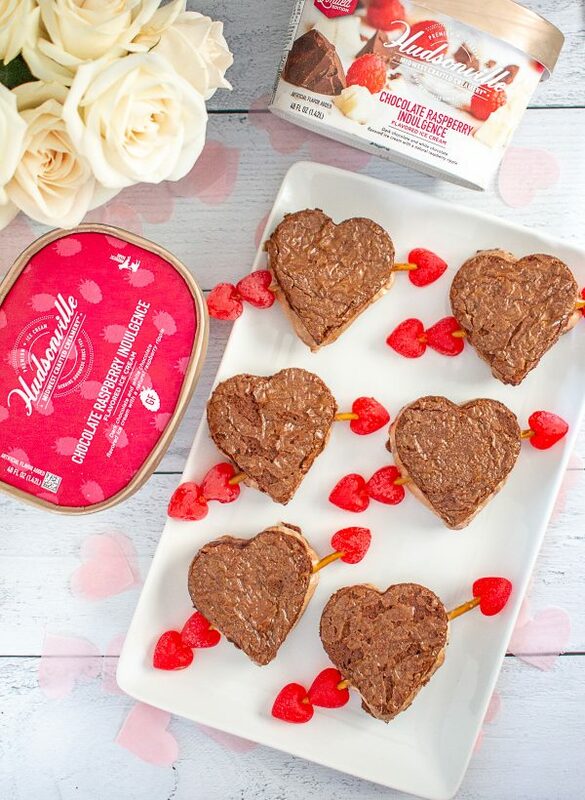 You just need the ice cream, boxed brownie mix (and all the ingredients called for on the box), parchment paper, pretzel sticks, and some gummy hearts. 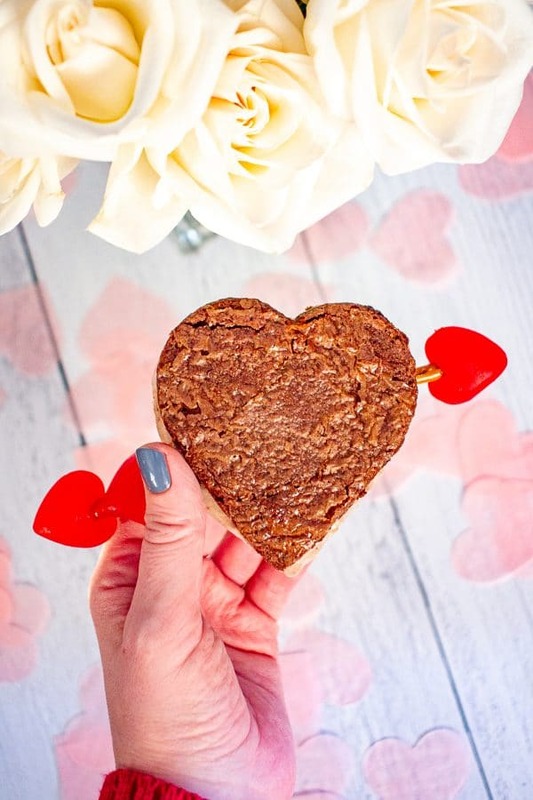 You also need a metal heart shaped cookie cutter – you want it to be metal that it is sturdy enough to cut through ice cream without breaking. To make the outside of the ice cream sandwiches, you just mix up the brownie mix and then pour it onto a large parchment-lined baking sheet (or two half-sized baking sheets). Bake for about 15 minutes, and let cool. I cut the brownie in half, and transferred half of the brownie into a half baking sheet with edges. Then I covered that brownie with ice cream and let it freeze until solid in my freezer. You will use the half of the brownies without the ice cream to be the top half of the ice cream sandwiches. 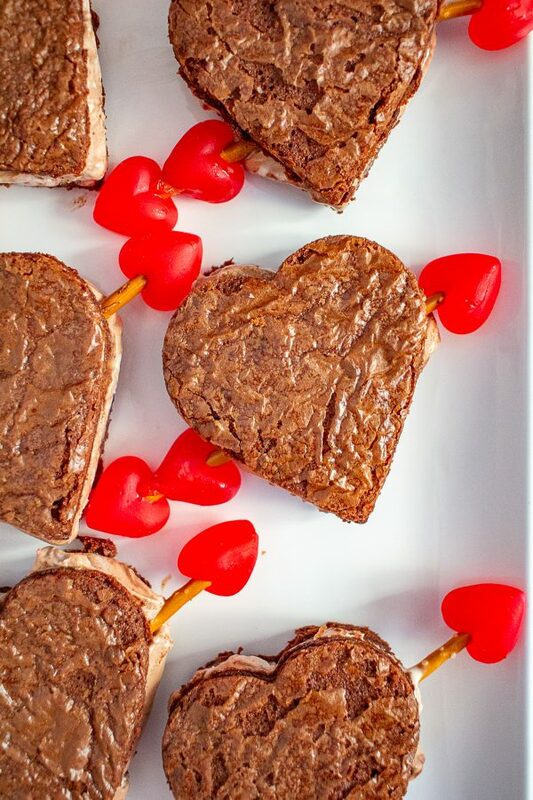 While you are waiting for the ice cream to set up again, prepare the heart-shaped gummies and pretzel sticks for the arrows. This works best if you use a skewer to poke a hole through the gummies first before sticking the pretzel stick through. Do this slowly so that the pretzel sticks don’t break. I used two pretzel sticks per ice cream sandwich, one for each end of the arrow simply because one pretzel stick isn’t long enough. Next you use the cookie cutter to cut out the heart shapes. Half of the brownies are topped with ice cream; this will be the bottom half of your ice cream sandwiches. The half without the ice cream will be the top. Use the cookie cutter to slice the tops of the ice cream sandwiches first. Then you want to use the same cookie cutter to cut the bottoms of the ice cream sandwiches. 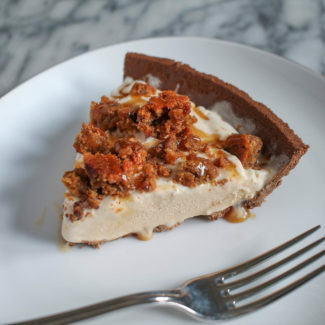 My trick to doing this is to lightly hit the cookie cutter with a meat mallet, this makes cutting through the frozen ice cream and brownie much easier. Once you have all of your bottom halves of the ice cream sandwiches, you just need to assemble the ice cream sandwiches! Add the gummies and pretzel sticks to add the arrow, and then add the top of the ice cream sandwich. 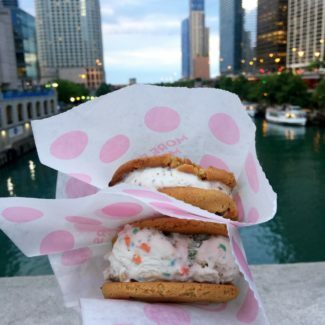 Return the assembled ice cream sandwiches to the freezer one last time, and store them there until you are ready to serve. I posted a series of stories on Instagram that demonstrate the step by step process of making these ice cream sandwiches. I have saved the stories to my highlights – sometimes seeing the instructions is easier than reading them. And to follow Hudsonville on social media, follow these links: Hudsonville Ice Cream Instagram, Hudsonville Ice Cream Facebook, and Hudsonville Ice Cream Twitter. 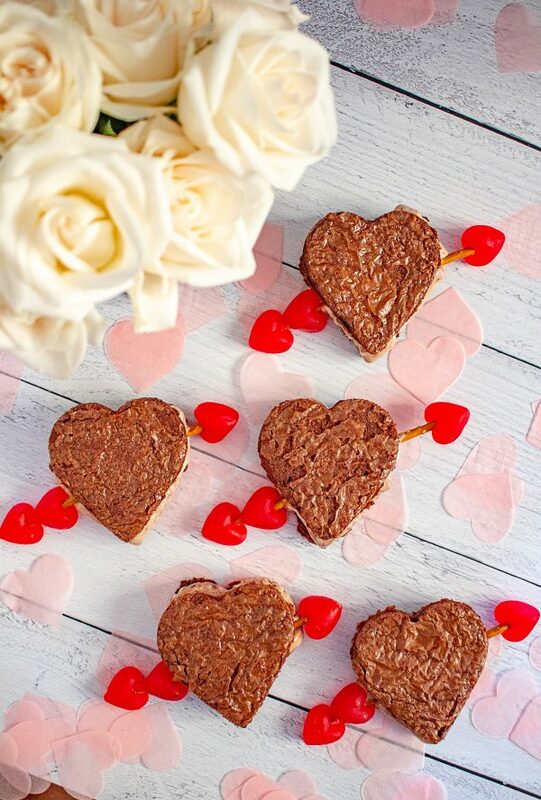 These ice cream sandwiches made with Hudsonville Ice Cream and boxed brownie mix are a perfect Valentine’s Day Dessert. Prepare the brownie mix according to the directions on the box. 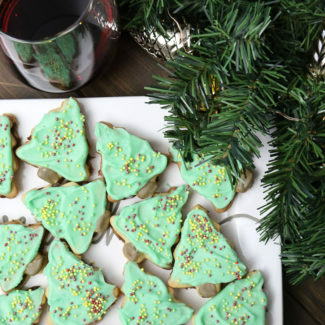 Evenly spread the batter onto a large (16x11 inch) baking sheet with edges, lined with parchment. Bake at 350 degrees, for about 15 minutes, until a toothpick inserted into the center comes out clean. Let the brownies cool. Then slice it in half, and place one half in a parchment lined half-sized baking sheet. Evenly spread a one-inch layer of Hudsonville’s Chocolate Raspberry Indulgence over the top. Place in the freezer for an hour to let the ice cream set up again. Set the rest of the brownies aside, it will be used to make the tops of the ice cream sandwiches. 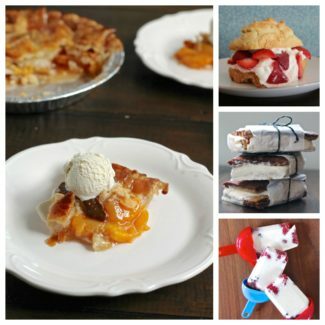 While the ice cream is hardening, prepare the other elements of the ice cream sandwiches. Use your cookie cutter to cut out the tops of the ice cream sandwiches from the brownies you set aside. Next, place the gummies on the pretzel sticks to create the arrows. To do this, first use a skewer or something similar to create a hole in the gummies, this makes it easier to pierce the gummies with the pretzel sticks. You want to use two pretzel sticks per ice cream sandwich, one for each end of the arrow. Add one gummy to a pretzel stick to make the sharp end of the arrow, and add two gummies to a pretzel stick to create the end of the arrow. Now it is time to assemble the ice cream sandwiches. Use the cookie cutter to cut through the ice cream topped brownies to make the bottom of the ice cream sandwiches. 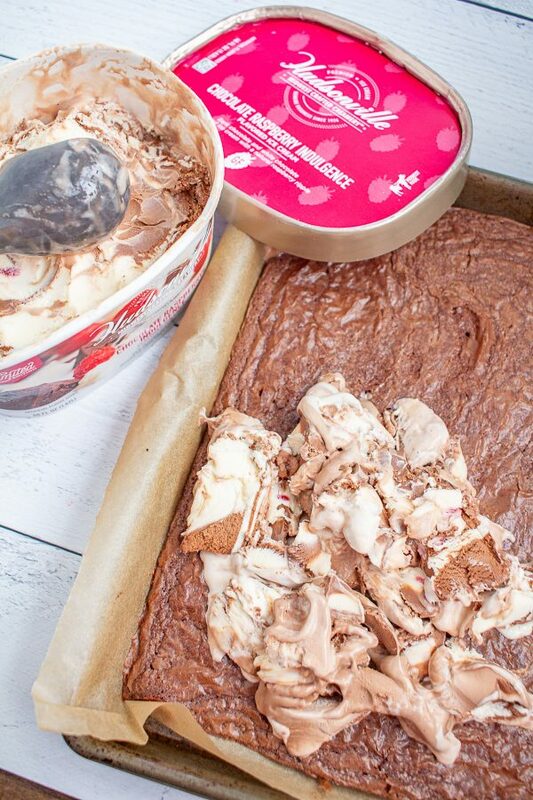 You may want to use a meat mallet to help press the cookie cutter through the frozen ice cream and brownie. 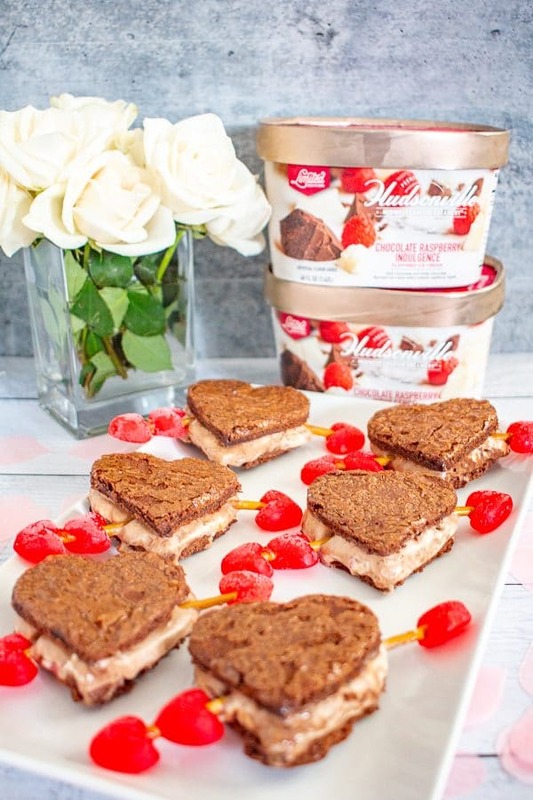 Create the arrow by adding the pretzels and gummies that you prepared on top of the bottom layer of the ice cream sandwiches, lightly pressing the pretzel into the ice cream. Then add the top layer of the ice cream sandwich. Continue assembling the ice cream sandwiches. Place the ice cream sandwiches in the freezer until you are ready to serve them. This post was sponsored by Hudsonville Ice Cream. 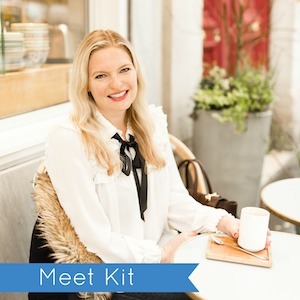 Thanks for supporting the brands that make The Kittchen possible.